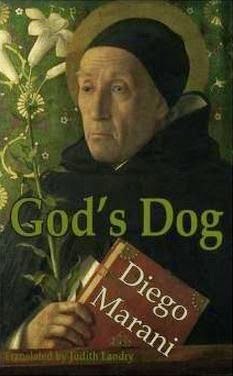 I've seen a great deal of praise for one of Diego Marani's previous novels, New Finnish Grammar, although I haven't yet got round to reading it and decided to start with God's Dog instead because I was so interested in the basic premise. God's Dog is set in a future in which the Catholic Church rules an unspecified chunk of the world as a sinister, Orwellian theocracy, able to pass laws, impose taxes (including an extra penalty for atheists) and operate a force of ordained police officers. Domingo Salazar is one such police officer and is called from the relative freedom of Amsterdam, where he is devoted to bringing down secularism in a number of ways, back to Rome, where he is assigned the task of tracking down a group of secular 'terrorists' who secretly arrange euthanasia for terminally ill hospital patients. The Church, of course, is particularly opposed to euthanasia - not just because it considers it a sin to 'play God' and end a patient's life, but because they believe suffering is an essential part of God's plan. Not only does the Church object to euthanasia, but it also insists that hospitals limit terminal patients' morphine doses. Treatment is only state-provided if patients' relatives attend regular prayer sessions. As the plot thickens, Salazar is caught up in a more far-reaching terrorist plot, and at the same time, his own zealous but controversial views on the best way to end secularism once and for all and his relationship with a Muslim scientist back in Amsterdam attract the attention of the religious authorities. The latter happens mainly because Salazar has conveniently written all his views and a record of his activities down in a diary, and this is one of the many things I have a problem with in God's Dog. Salazar is effectively a member of a secret police force, a theocratic Stasi, and yet inexplicably documents his potentially heretical ideas on paper in great detail. I did wonder whether this is actually a joke on Marani's part in what is, after all, a satire - but even if it is, while the contents of his diary are an opportunity for various theories on the nature of religion and humanity that are clearly important to Marani's overall themes, they are long-winded, repetitive and structurally disruptive. My other primary quibble with God's Dog is the writing itself. I know nothing of Italian and couldn't say whether it's Marani's writing I dislike or that of his translator, but I found much of the prose plodding and clunky, so much so that even a last minute dash to prevent a major terrorist attack in a huge crowd is rendered tedious. The writing in God's Dog is very much lacking in subtlety - and the same can be said of the satire, which is diverting but incredibly heavy-handed. I wanted so much to like God's Dog, but was ultimately left disappointed, and I would think twice about returning to Marani again.